Turner diffusa, known as Damiana is a shrub native to Central America, Mexico, South America, and the Caribbean. It belongs to the family Turneraceae. Damiana today is conventionally made into tea. 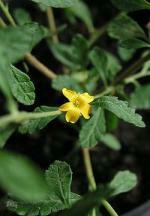 In herbal medicine, damiana is used for the treatment of conditions ranging from cough to constipation to depression. Herbal supplement known to help with fibromyalgia, energy, emphysema, low estrogen, frigidity, hot flashes, impotence, infertility, menopause, Parkinson's disease, PMS, inflammation of the prostate, Lou Gehrig's disease, and more dealing with reproductive organs in both males and females . Damiana has been used in the past as a tea to help teenagers overcome shyness & amp; self-confidence that sometimes accompanies puberty. Damiana also be used for sexual performance anxiety in adults. Gorka principle, Damianino, stimulates the nervous system and reproductive organs, and also allows nerve messages to more easily spread through the body. Consume more than one cup of tea Damiana, or a tincture of dropperful or two capsules per day, in order to avoid stressing the liver, since its effects are cumulative. It is generally considered safe, but avoid using Damiana in cases of urinary tract diseases or liver disease. While researchers have not found any information on the final Damiana has psychoactive effects, has recently been shown that the essential chemical structure of the plant, Damianino, have certain effects on the central nervous system. This chemical can therefore be responsible, in part, to reports of psychoactive effects, but studies have involved limited at this time.